Japan, the land of the rising sun, Samurai and Geisha, is still triggering our imagination, what is more, there seems to be a growing interest in Japan and her culture. Japan has a very rich history built upon a diversity of artforms and professional skills. Japanese artists and professionals are among the best in the world and throughout the ages they created a wonderful legacy for us. Gorgeous lacquer paintwork, elaborate carvings and unsurpassed metalwork are just a few areas where the Japanese excel at. Every now and then Yokoso Japanese Gardens has some very special antiquities in its collection. 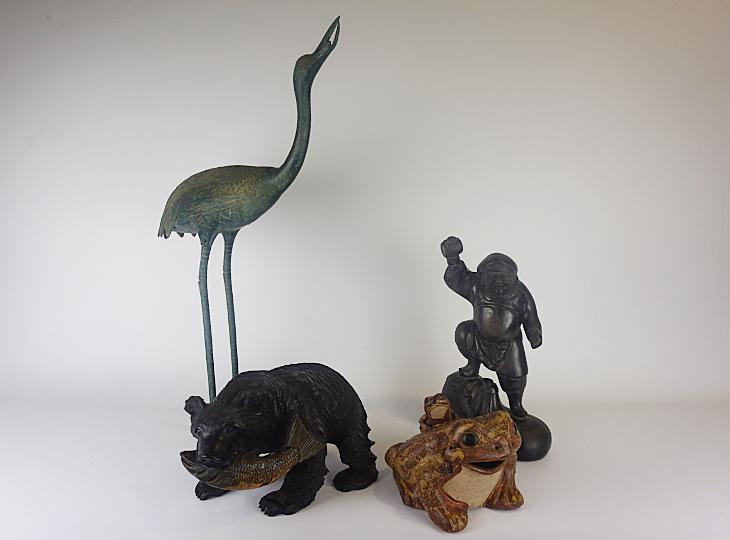 These objects are not only related to the Japanese garden but can be seen as a collection of decorative elements to be used in and around the house. Think of the very decorative Samurai Armor, beautiful authentic Japanese cabinets, Buddha statues and bronze pieces. In short, a great variety of Japanese art and antiques. For most people it is not an easy task to go "hunt" for these wonderful treasures themselves. Yokoso Japanese Gardens would be happy to assist and advise you. Yokoso Japanese Gardens has access to its own specialists and experts "in the field", working directly at the source, bidding at the various antiques auctions in Japan. This way, we already managed to secure some unique pieces for our customers. Yokoso Japanese Gardens is pleased to assist in guidance and advice when it comes to the right choice of Japanese antiques and decorations. Products that you won't be able to find on our website can, most likely, be ordered. Please use our contact form. Provide a clear description of the desired product and a reference to a picture on the internet and we will try to find the product for you.